“My husband is a great Gospel Doctrine teacher. I think there are going to be some disappointed people in our ward when he’s not there every Sunday morning to teach their class.” And Sister Claire Poelman was only half joking. 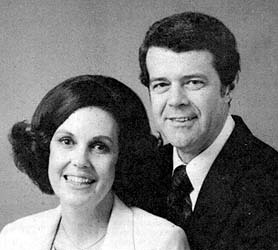 Claire S. and Ronald E. Poelman. Although Elder Ronald E. Poelman, newly sustained as a member of the First Quorum of the Seventy, has had administrative experience in the Church﻿—including seven years as counselor in a stake presidency, two years as bishop, one year as high councilor, and one year as bishop’s counselor﻿—his principal calling for the past eight years has been as a Sunday School teacher. “I love to teach, and I particularly love to teach from the scriptures. The Gospel Doctrine class has been ideal for my Church service,” he affirmed enthusiastically. How did Sister Poelman feel? “Overwhelmed!” But after struggling for ten years with cancer, Sister Poelman knows what it means to trust in the Lord. Today they have four children and three grandchildren. Elder Poelman received his law degree from the University of Utah in 1955 and later, in 1965, graduated from Harvard University Graduate School of Business Administration. Both he and his wife are also active in community affairs. Elder Poelman is a member of the San Francisco Symphony Foundation, Commonwealth Club of California, and World Trade Club, and is on the Board of Arbitration of the National Association of Securities Dealers. Sister Poelman, a graduate of BYU, has served as a consultant to Stanford Research Institute and, for five years, as chairperson of the “Reach to Recovery” Program in Santa Clara County. During the past ten years, she has counselled cancer patients daily. Born 10 May 1929, of active members of the Church, Elder Poelman always assumed that he would serve a mission and gladly accepted a call to the Netherlands Mission. But his testimony at that time was more a testimony of the Church than of the gospel﻿—that is, until one Sunday when illness kept him in while his companion was at a conference.